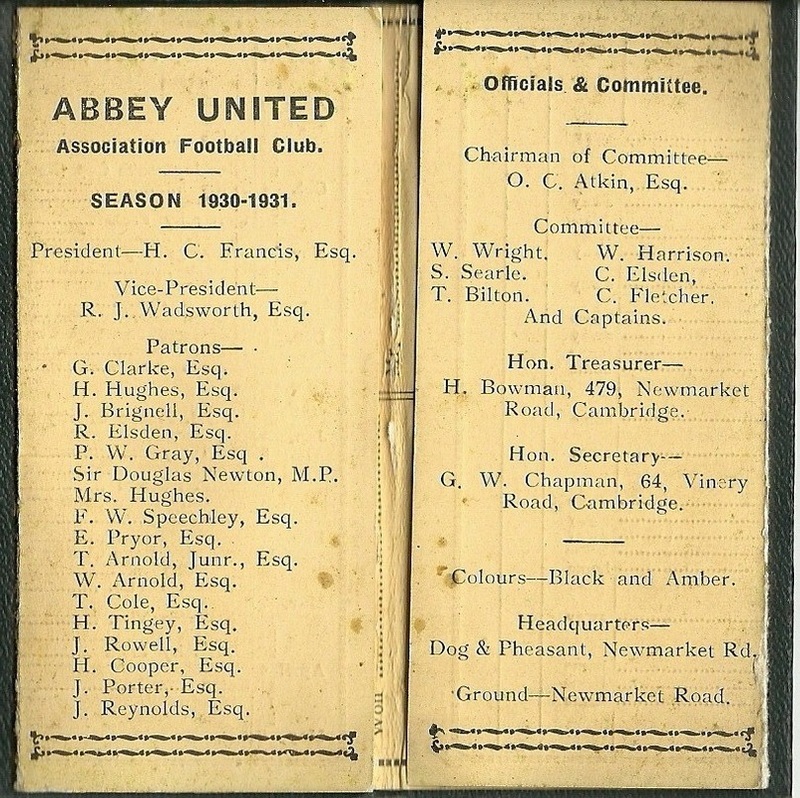 The early 1930s were a very average period on the field for Abbey United. The first League win of 1930/31 wasn't gained until March 7, although it was followed a week later by a 5-1 defeat of fellow relegation candidates Chesterton Victoria. A 4-3 victory at Coton Institute ended that club's chances of winning the league and caused 'bad feeling' between rival supporters. The Club finished second from bottom of the Cambridgeshire League Division One but somehow managed to gain a place in the newly formed Premier Division for the following season – despite two clubs above them not being admitted. The 1931/32 season saw a slight upturn in the club's fortunes, and Abbey finished seventh in the Cambridgeshire Premier League. The main reason for this poor run was the state of the Celery Trenches pitch, which had become so rutted that a lot of top players refused to play on it, and it was deemed unsuitable for the top level of the County League. After playing only one home game the club decided to play its remaining home matches on Parker's Piece, a 10-hectare common in the centre of Cambridge with strong sporting links. Having to play home matches on Parker's Piece seems to have proved difficult and a number of top players left, some of ending up at Cambridge Town. 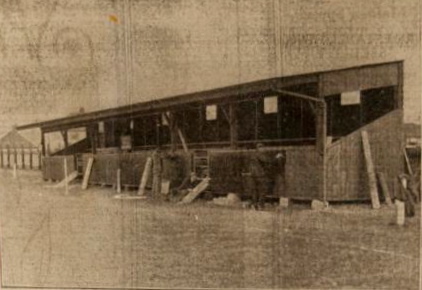 Club President Henry Clement Francis came up with a solution and in the summer of 1931 summoned the officers of the club to meet him on a piece of land at the back of Mr Sindall's builders' yard on Newmarket Road. Mr Francis made Abbey United two offers: they could accept all of the land he had acquired; or they could have a smaller piece and he would build a grandstand to accommodate between 300 and 400 people. The club decided to take up the second option and RJ Wadsworth, a Vice-President, was made responsible for building the dressing rooms. While the pitch was being laid the club returned to the Celery Trenches for one more season. The new ground on the site we now know as the Abbey Stadium was officially opened on Wednesday, 31 August 1932 with a friendly match against Cambridge University Press, two goals by Jackie Bond giving Abbey a 2-0 win. The first competitive match at the Abbey, a 5-4 defeat by Histon Institute in the FA Cup, was on 3 September 1932, with the first goal scored by Harvey Cornwell. Following that defeat, the first season at the Abbey progressed in similar fashion. United finished third in the Cambs Premier League and were knocked out of all cup competitions at the first time of asking. The season also included Abbey's record away defeat, by 11-4, at Wisbech Town. But the 1933/34 season saw a return to winning ways, with the Abbey winning the Creake Charity Shield once more and finishing runners-up in the Cambs Premier League and the Cottenham Nursing Cup. Not only did that season see the opening of the club's first grandstand and the first silverware for two years, it also brought about the first meeting with Cambridge Town at first-team level. There was bad feeling between the two clubs because the Town regularly 'stole' the Abbey's best players, being in a position to offer them jobs at a time of high unemployment. The two clubs met at Milton Road on 1 October 1933 in the First Qualifying Round of the FA Amateur Cup, but despite the Abbey players' keen desire to put on a good show, Town ran out 9-1 winners. Compared to previous seasons, silverware in the five years between 1934/35 and 1938/39 was sparse, although the Creake Charity Shield was won twice (in 1936 and 1939) and the Soham Nursing Cup once (1938). Two matches from this period, both against Haddenham, stand out. 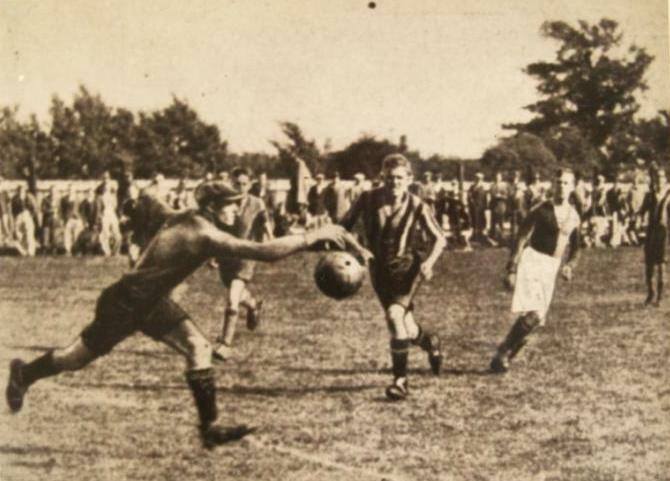 The 1936 Cottenham Nursing Cup semi-final was played in front of more than 2,000 people at Cottenham. The great interest the fixture provoked was probably due to the fact that Haddenham had won every one of their previous 19 matches and an upset was anticipated. The game finished 3-3 at full time but Haddenham went on to win 5-3 in extra time. Three years later it was the semi-final of the Creake Charity Shield that provided the thrills. Shortly after half-time in the match, played at Ely City's ground on 25 March 1939, the Abbey were leading by 7-2. After Haddenham had missed a penalty, their injured goalkeeper left his goal to play as an outfield player and with his help they staged a remarkable fightback and ended up losing just 7-6. Henry Clement Francis died in 1939 after a 20-year term as President. 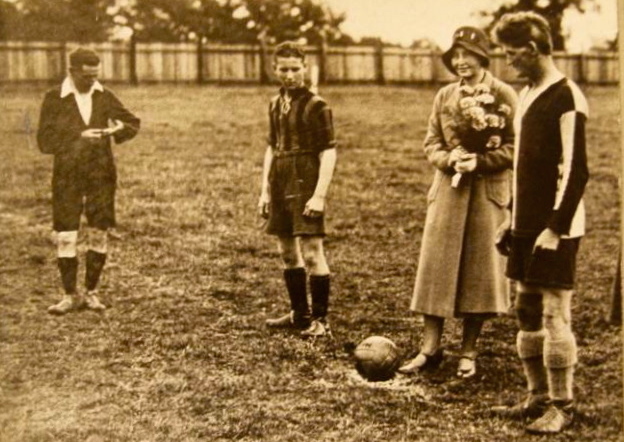 Abbey United's club officers were summoned to a meeting with his solicitors and told that the ground had been left in trust to the Mayor of Cambridge, the Vicar of Fen Ditton and the District Nursing Association, to be used for the playing of football by Abbey United (paying a nominal rent of half a crown a year) and grazing. In those days only very wealthy sports clubs had mechanical means of cutting grass, so sheep were left to graze on the pitch all day on the Friday. Committee members would clear the pitch of droppings the following morning. 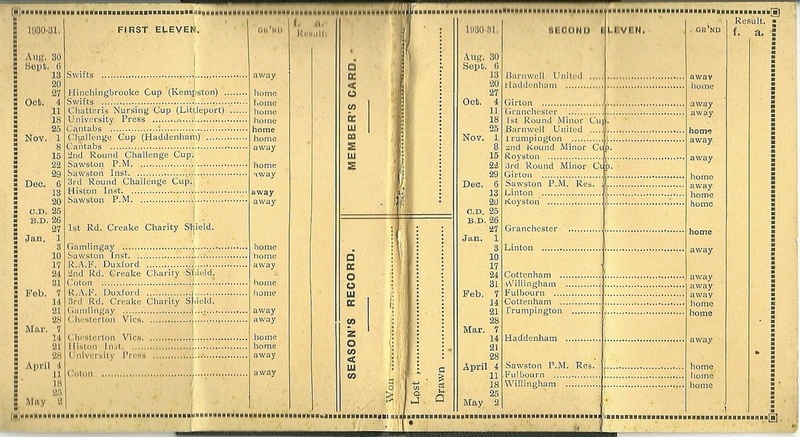 Above, Abbey United fixtures for the 1930/31 season. Below, many of the patrons and officials remained from 1929/30. 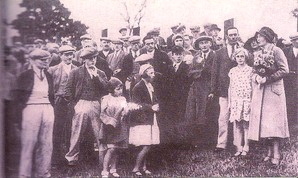 Above and below, Abbey United's new ground was officially opened on Wednesday, 31 August 1932. RJ Wadsworth, Senior Vice-President, performed the opening ceremony, accompanied by Mrs KRJ Saxon, daughter of the President, Henry Clement Francis. Above, Abbey United goalkeeper Coulson gathers the ball in the first competitive match at the new ground, on 3 September 1932. United's Harvey Cornwell, who scored the first goal, is also pictured in action. The FA Cup First Qualifying Round match finished Abbey United 4, Histon Institute 5. 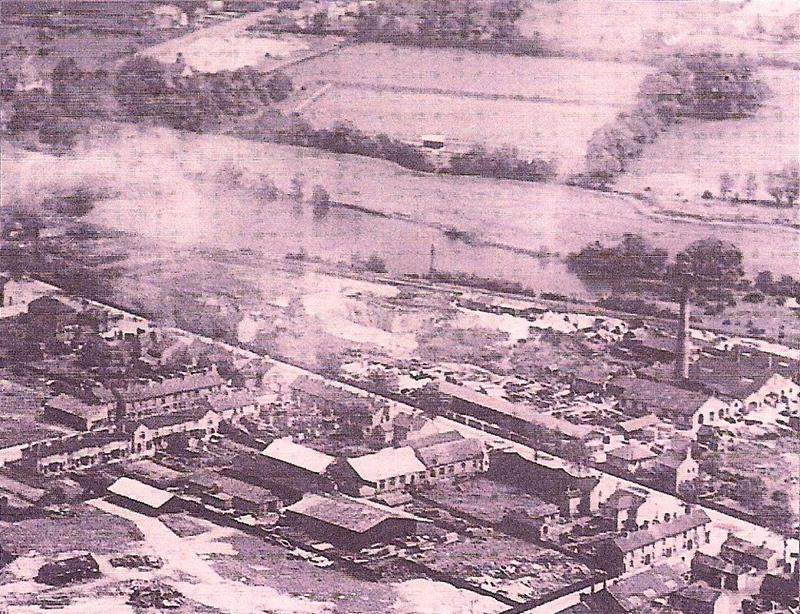 Above, the Abbey Stadium (top middle) in 1934, shortly before the construction of the first grandstand, left, provided by club President Henry Clement Francis.